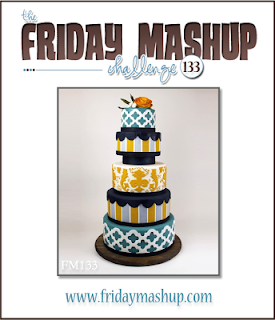 It's Friday Mashup time again and this week we say goodbye to another DT member, Amy. She is the host of this weeks challenge and I hope you'll come over and play along, and say goodbye to her. You can follow Amy at her blog HERE so you don't have to miss any of her beautiful creations! Coastal Cabana, Crushed Curry, Smoky Slate & Basic Grey. This stumped me for a bit but since I needed to make an anniversary card for my aunt and uncles 20th wedding anniversary I grabbed the Love & Laughter set and used the cake from there. I used Smoky Slate and Crushed Curry markers to color the stamp. The Smoky Slate was embossed for one of the panels behind the image and then I used some Coastal Cabana DSP. With this cake stamp I like more definition so I drew in lines around the cake and added some tiny pearls to the corners. Make sure you come play along with us at The Friday Mashup and say goodbye to Amy! Create a project with the colors "Coastal Cabana, Crushed Curry, Smoky Slate & Basic Grey." Create a project with a "Cake." Or Mash it Up and create a project "with a Cake using the colors above." Oh, I didn't even recognize the stamp... a perfect anniversary card! This is so pretty LIsa. I love all the texture you created. Love the mosaic background, Lisa. The ribbon in triplicate is such a neat detail. I like how you used the DSP. 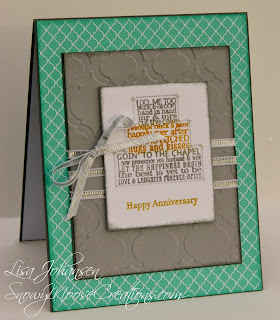 Such a pretty card to celebrate an anniversary! Great idea to use that wedding cake for an anniversary card! Love the mosaic background as well! It's been so great being on the DT with you - thanks for all your fun challenges and encouraging comments!